My oldest brother, Steve, loves ice cream cake. I made this ghetto ice cream cake 3 years ago. 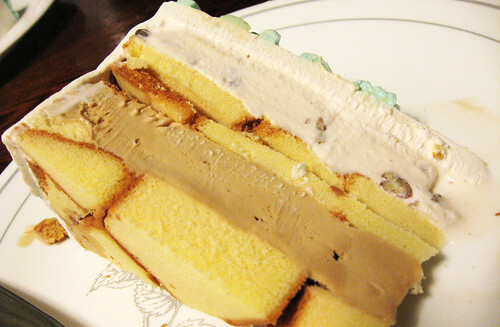 I just took the Sarah Lee's pound cake and cut it up, smushed it into a cake pan then layered ice cream on top of it. Haha.. it makes me laugh. So for his birthday this year I knew I was going to make an ice cream cake of some sort. 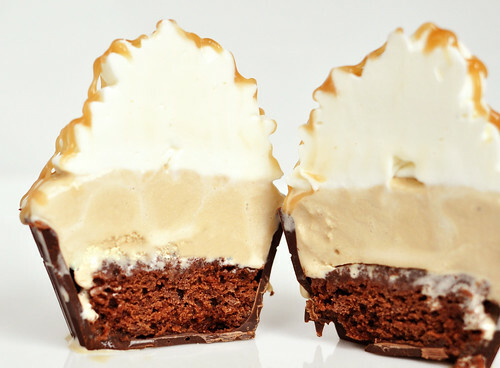 I remember seeing this ice cream cupcake at Cold Stone's the other week that had a chocolate cupcake wrapper with cake in the center layered with ice cream then topped with whipped cream. It sounded like a great idea... so I jacked it! 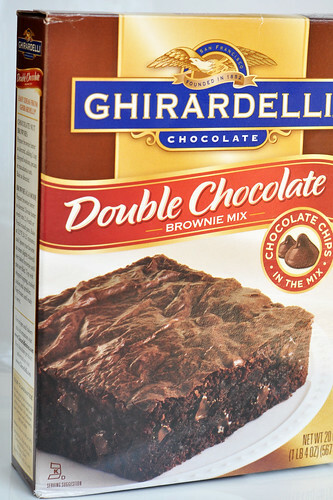 Normally, I try not to use box mixes but Ghirardelli makes pretty awesome brownie mixes. Any time I can cut down my prep time I'm all for it. 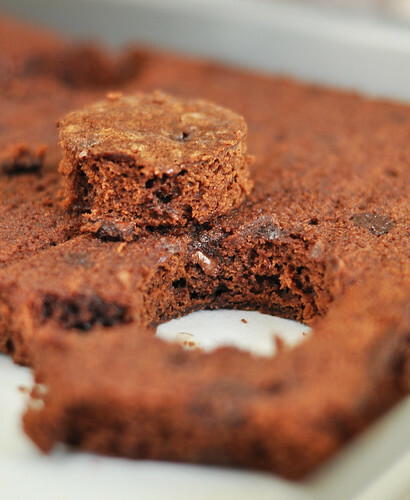 I started by making the brownie in a 1/4 sheet pan which is half the size of a standard home size sheet pan. 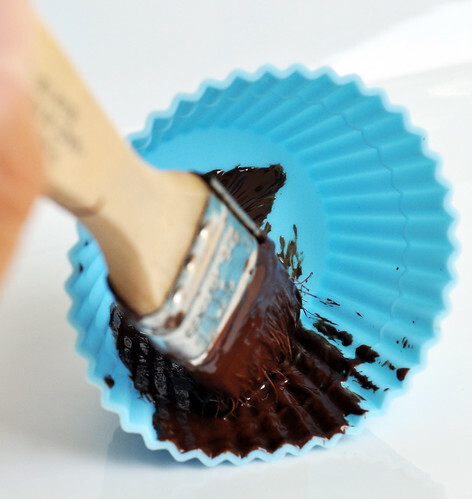 After that baked, I got to work on the chocolate cupcake wrapper. 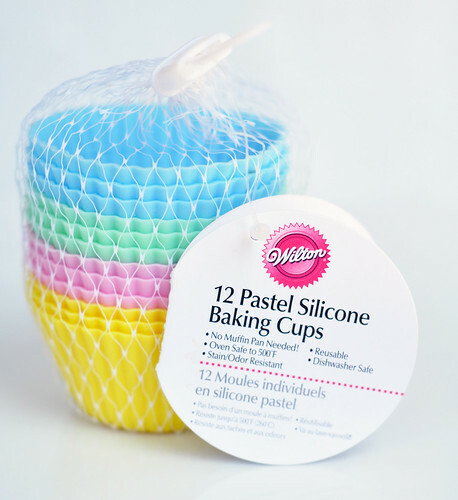 I got these silicone cupcake cups from Michael's, again, using a 40% off coupon I found online. Now, for the chocolate I tempered mine (which is a separate post in itself on melting chocolate.. which I will do soon) but you really don't have to. Just melt it in the microwave. I took a brush and brushed the inside of the cup.. one at a time. This helps to get in all the nook and crannies of the cup. 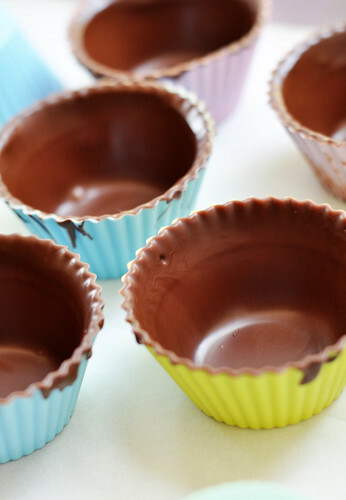 If you just poured the chocolate in there are chances that air bubbles might form in the grooves creating an annoyingly uneven exterior. Then I filled the cup about half way with the chocolate. 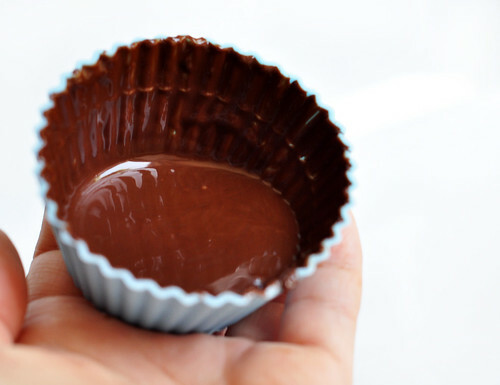 Then I poured out the chocolate but made sure I covered all of the sides of the cup to create an even layer of chocolate. I hung it upside down for a few seconds shaking of as much of the excess chocolate as possible. Turn right side up and put immediately into the fridge to harden. Continue with the rest. 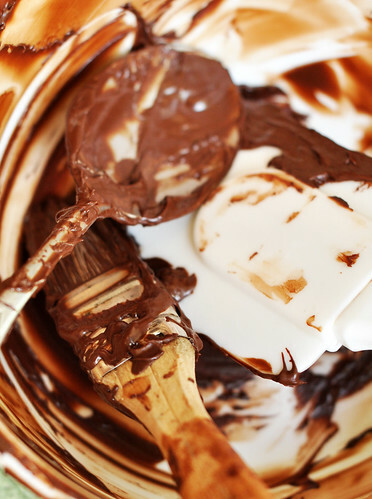 One thing I really dislike about working with chocolate is how extremely messy and hard to clean it is. So messy!!! 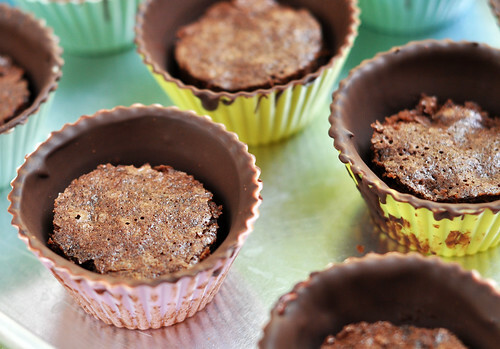 After the chocolate was done and have chilled thoroughly in the fridge I took a round cutter similar to the size of the bottom of the cup and cut the brownie. I stuck it in the freezer to chill as I prepared my ice cream. 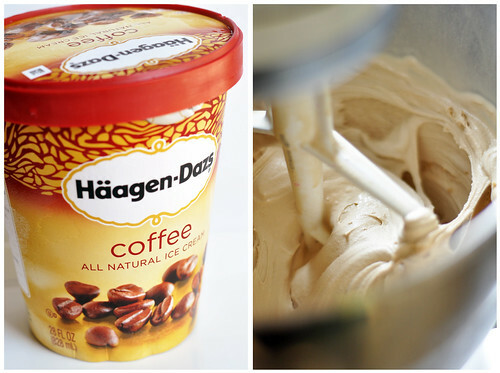 My brother and I love coffee ice cream so I got a 28 fl oz carton of ice cream, defrosted it a bit then loosened it in the mixer to get it smooth. At this point I took a piping bag with a star tip to pipe the ice cream in and making the ice cream look like the icing. Once I had finished the ice cream looked like it was icing because of the way it was piped and it looked really good. I stuck it in the freezer of my mini fridge because our large freezer had no room. When I came back to it an hour or so later... the ice cream had sunken completely into the cup. It was flat. Arrg. To unmold, it takes a bit of work. You have to work your way around the top first then peel off the rest. But.. when it comes out.. it looks pretty neat! Minus that line going all the way around. 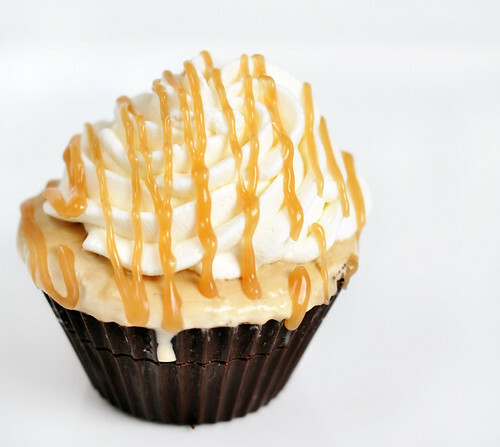 It's there to tell you not to fill the cupcake batter past that point. Minor issue. I didn't want to put whipped cream in but I didn't have a choice. My brother asked for some caramel so I made that for an additional topping. It turned out pretty well.. despite the freezer mishap. 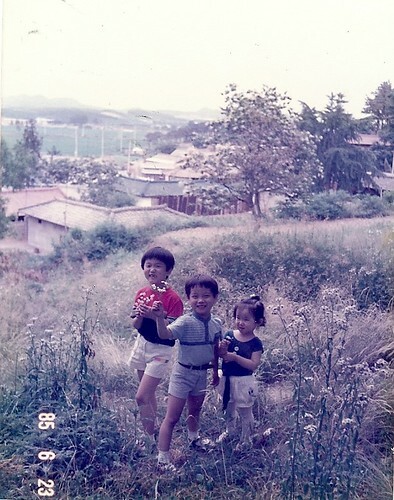 Happa Birthday Oppa! 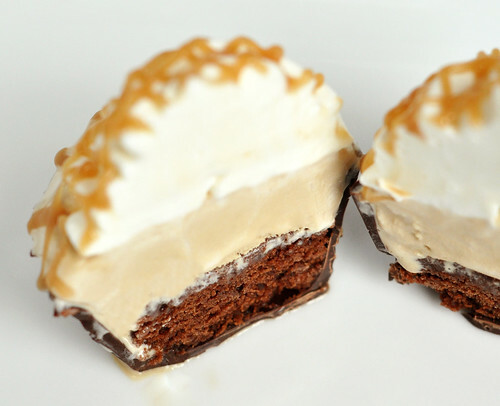 Those ice cream cupcakes look heavenly!